Way back when GTA: San Andreas was released, a false rumor spread around that Bigfoot could be found in the game somewhere if you looked hard enough. He wasn’t actually in it, but the tale inspired Rockstar Games to make the yeti reality in future installments. 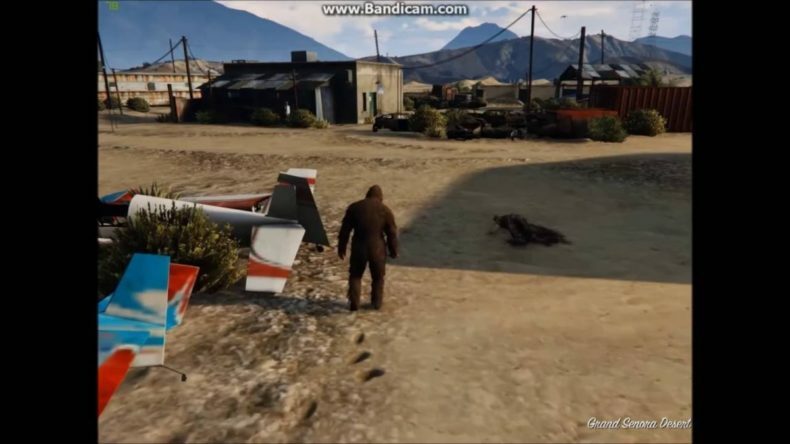 GTA V contains the most blatant tribute yet, in the form of a hidden mode that turns you into Bigfoot for a few minutes. In the context of the game this happens in a dream sequence (I guess Bigfoot is too far-fetched even for GTA’s reality), but it’s triggered by eating a hallucinogenic flower called a peyote. This flower would only appear between 5:30 and 8 in the morning game-time, and only if the weather was foggy or snowy. This didn’t turn out to be the end. More recently, further investigation of the peyote phenomenon revealed you could find them on more than one day. The message “He was wrong to start his hunt on Tuesday’ was discovered in the game code next to where the peyotes were programmed, and it led to a quest to find all seven (which wasn’t easy, as the weather had to cooperate by chance). Finally someone did it, and got…..nothing. The community was about to give up when Rockstar updated the code. The hidden message now said “His quarry seemed familiar.” Players discovered that this riddle referred to a second yeti that could be hunted down during the hallucinatory sequence only. Many attempted it, but so far only one has succeeded, and here’s the video of his kill (the stormy weather is a nice touch, Rockstar). So what do you get for all this trouble? A special new character becomes usable in Director Mode: the yeti, decked out in a high school jacket and jeans. This is what he’s wearing when you hunt him, as a tribute to Michael J. Fox in Teen Wolf.